The Type 5 medium tank Chi-Ri (五式中戦車 チリ, Go-shiki chusensha Chi-ri) ("Imperial Year 2605 Medium Tank Model 9") was a medium tank developed by the Imperial Japanese Army in World War II. Intended to be a heavier, more powerful version of Japan's prototype Type 4 Chi-To medium tank, in performance it was designed to surpass the US M4 Sherman medium tanks being fielded by the Allied forces. A single prototype was incomplete when the war ended. Based on battlefield information from the Eastern Front, Department of Arm Weaponry published a report demanding a shift of tank design focus from Infantry tank to tanks specialised for anti-tank missions. The Army's requirements for the new medium tanks were an increase of weight from 20 tonnes to 35 tonnes and an armour upgrade from 50 mm to 75 mm. The new tank would be mounted with a new 75 mm gun instead of the previous 57 mm anti-tank gun. Production focus would also prioritise quality over quantity. The new medium tank was designated as Type 5 Medium Tank Chi-Ri (五式中戦車 チリ). A single unarmed prototype of the Type 5 Chi-Ri was completed by May 1945. The project was abruptly abandoned to free up manpower and critical resources to concentrate on the development and production of the more practical Type 4 Chi-To medium tank. As with many innovative weapons projects launched by Japan in the final years of World War II, production could not advance beyond either small numbers or the prototype stage due to material shortages, and the loss of Japan's industrial infrastructure to the Allied bombing of Japan. It was the last tank "developed" by the Imperial Japanese Army. The Type 5 Chi-Ri featured a lengthened version of the Type 4 Chi-To chassis, with eight road wheels per side instead of the seven of the Chi-To. It had the usual Japanese track arrangement with forward mounted drive sprockets and rear mounted idlers. The Type 5 Chi-Ri had sloped welded armor, with a maximum thickness of 75 mm at the front hull; 25–50 mm on the side; 50 mm on the rear and 50 mm on the turret. The Type 5 Chi-Ri was initially to be powered by a Mitsubishi Diesel engine, but the advancements needed to provide the necessary horsepower fell behind schedule, and an 800 hp V-12 gasoline-fueled aircraft engine designed by BMW in Germany and licensed to Kawasaki Heavy Industries in Japan was selected instead. The "Kawasaki Type 98 800 HP engine Ha-9-IIb" was detuned for the tank to 550 hp. The tank had a hexagonal gun turret and on the left side of the turret roof was a commander's cupola. In front of that was a crew hatch. Originally, the prototype tank was to be fitted with the same Type 5 75 mm tank gun (based on the Type 4 75 mm AA Gun) used on the Type 4 Chi-To. Eventually an 88 mm gun (based on the Type 99 88 mm AA Gun) was planned for the main turret gun. A secondary weapon of a fixed front hull-mounted Type 1 37 mm tank gun was fitted in the position normally taken by a machine gun. Alternatively, the design called for using two Type 97 heavy tank machine guns in place of the front hull-mounted Type 1 37 mm tank gun. Accordingly to another source, the design called for a ball mount for a Type 97 machine gun on the left side of the turret for use in close combat situations. There were also plans for a Type 5 Chi-Ri II, to be diesel powered and using the Type 5 75 mm tank gun as its main armament. As with the Type 4 Chi-To tanks, the Type 5 Chi-Ri was originally considered for the final defense of the Japanese home islands against the expected Allied invasions. However, only the one unarmed prototype had been completed by the time the war in the Pacific came to an end. The prototype Type 5 Chi-Ri was seized by American forces during the occupation of Japan and earmarked for tests at the Aberdeen Proving Grounds. According to one source, the prototype was eventually scrapped. The Ho-Ri I was a more powerful tank destroyer (gun tank) using a 105 mm cannon in place of the 75 mm gun design and an additional 37 mm gun in the front armored plate. The armor was to be 30 mm thick and it was to have a crew of six. It used the Type 5 Chi-Ri tank chassis. The superstructure for the main gun was placed at the rear, the engine was positioned in the center area of the chassis and the driver's station was in the front hull section; all similar in design to the German Ferdinand/Elefant heavy tank destroyer. 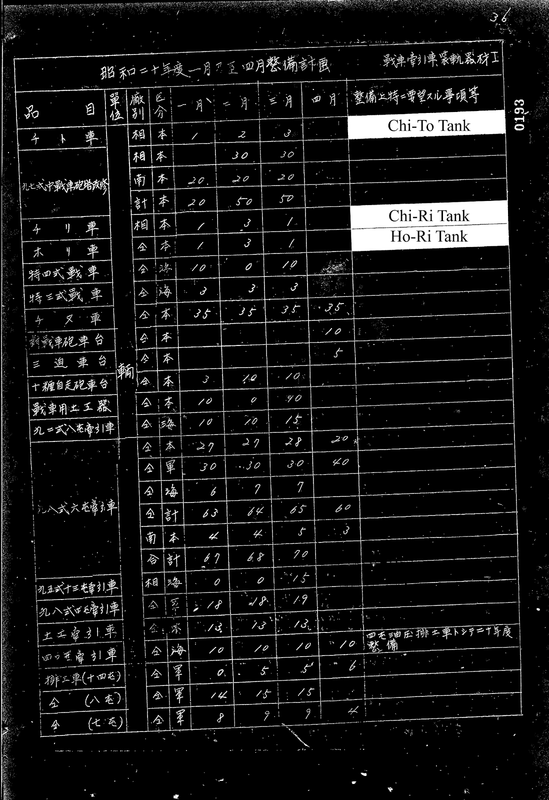 According to "The National Institute for Defense Studies, Ministry of Defense, Military Administration of Munitions Mobilization, Production Chart of January to April of 1945", the plan was to produce a total of 5 Ho-Ri gun tanks by March 1945. However, no prototypes are known to have been completed. Another variant of the Ho-Ri was to have a twin 25 mm anti-aircraft gun on top of the rear casemate superstructure in a "swivel mount". A second version planned was the Ho-Ri II heavy tank destroyer. It was to use the Type 5 Chi-Ri tank chassis. The boxy superstructure for the main gun was completely integral with the hull's sides and placed at the center of the chassis (similar in design to the German Jagdtiger). The engine compartment was moved in the rear area of the chassis. It also was to use a 105 mm cannon as its main armament. ^ a b c d Taki’s Imperial Japanese Army: Type 5 Medium Tank "Chi-Ri"
^ a b c d e f g h i Tomczyk 2005, p. 30. ^ Tomczyk 2005, pp. 3, 5, 29. ^ a b Tomczyk 2005, pp. 29, 30. ^ Tomczyk 2005, p. 46. ^ Tomczyk 2007, pp. 10, 30. ^ "The National Institute for Defense Studies, Ministry of Defense, Military Administration of Munitions Mobilization, Production Chart of January to April of 1945"
^ Tomczyk 2007, p. 10. ^ Hara & Eimori. (1978) . Japanese Tanks & Armoured Vehicles Vol. 2. Tokyo: Shuppan Kyodo Sha, p. 165. ^ Tomczyk 2007, p. 32. ^ Tomczyk 2007, pp. 10, 33–35. Tomczyk, Andrzej (2007). Japanese Armor Vol. 5. AJ Press. ISBN 978-8372371799. Zaloga, Steven J. (2007). Japanese Tanks 1939–45. Osprey. ISBN 978-1-8460-3091-8. Wikimedia Commons has media related to Type 5 Chi-Ri. This page was last edited on 3 March 2019, at 01:00 (UTC).